ATTENTION: Please take a few minutes to thoroughly read this user guide which should be saved for future reference and passed on to any subsequent owner. What To Do When The Alarm Sounds! Actuation of your CO Alarm indicates the pressence of Carbon Monoxide (CO) which can kill you. 1) Immediately move to fresh air � outdoors or by an open door/window. Do a head count to check that all persons are accounted for. Do not re-enter the premises nor move away from the open door/window until the emergency services responders have arrived, the premises have been aired out, and your alarm remains in its normal condition. Alternatively, for solid fuel emergencies call HETAS (0845 634 5626) or for oil based emergencies call Oftec (0845 658 5080). Never restart the source of the CO problem until it has been corrected. Never ignore the sound of the alarm! If the alarm is sounding, pressing the test/reset button will terminate the alarm. If the CO condition that caused the alert in the first place continues, the alarm will reactivate. If the unit alarms again within six minutes, it is sensing high levels of CO which can quickly become a dangerous situation. NEVER IGNORE THE SOUND OF THE ALARM! NEVER IGNORE THE SOUND OF THE ALARM! Determining what type of alarm has sounded is easy with your Kidde Combination Smoke/CO Alarm. The voice message warning system will inform you of the type of situation occurring. Refer to the Features section on page 4 for a detailed description of each alarm pattern. Smoke alarms are designed to minimize false alarms. Cigarette smoke will not normally set off the alarm, unless the smoke is blown directly into the alarm. This unit contains nuisance alarm protection, which will reduce the impact of cooking particles. However, large quantities of combustible particles from spills or grilling could still cause the unit to alarm. Careful location of the unit away from the kitchen area will give the maximum nuisance alarm protection. Combustion particles from cooking may set off the alarm if located too close to the cooking area. Large quantities of combustible particles are generated from spills or when broiling. Using the fan on a range hood which vents to the outside (non- recirculating type) will also help remove these combustible products from the kitchen. If the alarm sounds, check for fires first. If a fire is discovered follow these steps. Become thoroughly familiar with these items, and review with all family members! Alert small children in the home. Children sleep very soundly and may not be awakened by the sound of the smoke alarms. Leave immediately using one of your planned escape routes (see page 25). Every second counts, don�t stop to get dressed or pick up valuables. Before opening inside doors look for smoke seeping in around the edges, and feel with the back of your hand If the door is hot use your second exit. If you feel it�s safe, open the door very slowly and be prepared to close immediately if smoke and heat rush in. If the escape route requires you to go through smoke, crawl low under the smoke where the air is clearer. Go to your predetermined meeting place. When two people have arrived one should leave to call 999 from a neighbour's home, and the other should stay to perform a head count. Do not reenter under any circumstance until fire officials give the go ahead. Thank you for purchasing the Kidde Combination Photoelectric Smoke and Carbon Monoxide Alarm model 10SCO. Please take a few minutes to thoroughly read this user guide which should be saved for future reference. Teach children how to respond to the alarms, and they should never play with the unit. Your Kidde Smoke/CO Alarm was designed to detect both smoke and carbon monoxide from any source of combustion in a residential environment. It is not designed for use in a caravan or boat. This apparatus is NOT a substitute for maintenance of fuel burning appliances and venting/exhaust systems If you have any questions about the operation or installation of your alarm, please call our toll free Consumer Hotline at 0800 917 0722. The guide on page 8 will help you determine the correct location of safety products that will help keep your home a safer place. Permanent independent smoke and carbon monoxide sensors. Smoke alarm takes precedence when both smoke and carbon monoxide are present. FIRE: The alarm/voice pattern is three long alarm beeps followed by the verbal warning message �FIRE! FIRE!�. This pattern is repeated until the smoke is eliminated. The red LED light will flash while in alarm/voice mode. CARBON MONOXIDE: The alarm/voice pattern is four short alarm beeps followed by the verbal warning message �WARNING! CARBON MONOXIDE!�. After four minutes the alarm/voice pattern will sound once every minute until the unit is reset, or the CO eliminated. The red LED light will flash while in alarm/voice mode. LOW BATTERY: This alarm has a low battery pre-warning. The red LED will flash every 60 seconds for a period of 28 days. Following this pre-warning, when the battery is low and needs replacing, the red LED will flash and the unit will "chirp" one time, followed by the warning message "LOW BATTERY". This cycle will occur once every minute for the first hour. After the first hour the red LED light will continue to flash every minute accompanied by the �chirp� only sound. The voice message �LOW BATTERY� will sound once every fifteen minutes during the �chirp� only cycle. This will continue for at least seven days. System announces �HUSH MODE ACTIVATED� when the unit is first put into HUSH Mode. System announces �HUSH MODE CANCELLED� when unit resumes normal operation after Hush Mode has been cancelled. System announces �CARBON MONOXIDE PREVIOUSLY DETECTED� when the unit has detected CO concentrations of 100 ppm or higher. System announces �PUSH TEST BUTTON� when the unit is powered up, reminding user to activate the Test Button. One �chirp� every 30 seconds is an indication that the alarm is malfunctioning. If this occurs call the Consumer Hotline at 0800 917 0722. After ten (10) years of cumulative power up, this unit twice every 30 seconds. This is an "operational end of life" feature which will indicate that it is time to replace the alarm. HUSH Control Feature that silences the unit during nuisance alarm situations (see page 16). Green Light: The green LED will be lit continuously or flash every 30 seconds to indicate the unit is operating properly. In HUSH� mode the LED blinks every 2 seconds and once per second if it is the initiating alarm. Red Light: When a dangerous level of smoke or carbon monoxide is detected the red LED light will flash and the corresponding alarm pattern (depending on the source) will sound. If the unit malfunctions, the red LED light will flash and the unit will chirp every 30 seconds indicating a system problem.If the red LED flashes every 60 seconds WITHOUT an audible chirp, this is the pre-warning that the battery will soon need replacing. The alarm is battery operated with a 9V battery. The smoke alarm monitors the air for products of combustion that are produced when something is burning or smouldering. When smoke particles in the smoke sensor reach a specified concentration, the alarm/voice message warning system will sound, and be accompanied by the flashing red LED light. The smoke alarm takes precedence when both smoke and carbon monoxide are present. Life safety from fire in residential occupancies is based primarily on early notification to occupants of the need to escape, followed by the appropriate escape actions by those occupants. Fire warning systems for dwelling units are capable of protecting about half of the occupants in potentially fatal fires. Victims are often intimate with the fire, For the old, young, or physically or mentally impaired such that they cannot escape even when warned early enough that escape should be possible. For these people, other strategies such as protection-in-place or assisted escape or rescue are necessary. Smoke alarms are devices that can provide early warning of possible fires at a reasonable cost; however, alarms have sensing limitations. Ionisation sensing alarms may detect invisible fire particles (associated with fast flaming fires) sooner than photoelectric alarms. Photoelectric sensing alarms may detect visible fire particles (associated with slow smouldering fires) sooner than ionisation alarms. Home fires develop in different ways and are often unpredictable. For maximum protection, Kidde recommends that both Ionisation and Photoelectric alarms be installed. A battery powered alarm must have a battery of the specified type, in good condition and installed properly. Smoke alarms must be tested regularly to make sure the batteries and the alarm circuits are in good operating condition. Smoke alarms cannot provide an alarm if smoke does not reach the alarm. Therefore, smoke alarms may not sense fires starting in chimneys, walls, on roofs, on the other side of a closed door or on a different floor. If the alarm is located outside the bedroom or on a different floor, it may not wake up a sound sleeper. The use of alcohol or drugs may also impair one�s ability to hear the smoke alarm. For maximum protection, a smoke alarm should be installed in each sleeping area on every level of a home. Although smoke alarms can help save lives by providing an early warning of a fire, they are not a substitute for an insurance policy. Home owners and renters should have adequate insurance to protect their lives and property. The carbon monoxide (CO) alarm monitors the air for the presence of CO. It will alarm when there are high levels of CO present, and when there are low levels of CO present over a longer period of time. When a CO condition matches either of these situations, the alarm/voice message warning system will sound, and be accompanied by the flashing red LED light. The carbon monoxide sensor uses an electrochemical technology. CAUTION: This alarm will only indicate the presence of carbon monoxide gas at the sensor. Carbon monoxide gas may be present in other areas. Individuals with medical problems may consider using warning devices which provide audible and visual signals for carbon monoxide concentrations less than 30 ppm. IMPORTANT: THIS ALARM MUST BE MOUNTED ON A CEILING OR WALL. IT WAS NOT DESIGNED FOR USE AS A TABLETOP DEVICE! INSTALL ONLY AS DETAILED! Kidde recommends the installation of a Smoke/CO Alarm in the following locations. For maximum protection we suggest an alarm be installed on each level of a multilevel home, including every bedroom, hallways, finished attics and basements. If installing this alarm in the kitchen, please note that sometimes cooking fumes or steam can result in 'nuisance' smoke alarms which can be minimized by locating the alarm away from sources of cooking fumes or steam. Put alarms at both ends of bedroom, hallway or large room if hallway or room is more than 30 ft (9.1m) long. If you have only one alarm, ensure it is placed in the hallway outside of the main sleeping area, or in the main bedroom. Verify the alarm can be heard in all sleeping areas. Locate an alarm in every room where someone sleeps with the door closed. The closed door may prevent an alarm not located in that room from waking the sleeper. Smoke, heat and combustion products rise to the ceiling and spread horizontally. Mounting the alarm on the ceiling in the centre of the room places it closest to all points in the room. Ceiling mounting is preferred in ordinary residential construction. 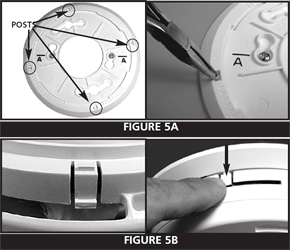 When mounting an alarm on the ceiling, locate it at a minimum of 4� (10cm) from the side wall (see figure 1). If installing the alarm on the wall, use an inside wall with the top edge of the alarm at a minimum of 4� (10cm) and a maximum of 12� (30.5cm) below the ceiling (see figure 1). Modern mobile homes have been designed and built to be energy efficient. Install Smoke/CO alarms as recommended previously (refer to Recommended Installation Instructions and figure 1). In older mobile homes that are not well insulated, extreme heat or cold can be transferred from the outside to the inside through poorly insulated walls and roof. This may cause a thermal barrier, which can prevent smoke from reaching an alarm mounted on the ceiling. In such mobile homes install your Smoke/CO Alarm on an inside wall with the top edge of the alarm at a minimum of 4 inches (10cm) and a maximum of 12 inches (30.5cm) below the ceiling (See figure 1). This product is intended for use in ordinary indoor locations of family living units. Avoid humid areas (such as bathrooms) with greater than 90% relative humidity (RH), non-condensing, or areas with temperatures outside of the operating range (0-40C). Keep away from sinks. YOUR SMOKE/CO ALARM IS SEALED AND THE COVER IS NOT REMOVABLE! To help identify the date to replace the unit, a label has been affixed to the side of the alarm. Write the �Replace by� date (10 years from initial power up) in permanent marker on the label. See Alarm Replacement section for additional information. Remove the mounting bracket from the back of the alarm by holding the mounting bracket and twisting the alarm in the direction indicated by the �OFF�arrow on the alarm cover. 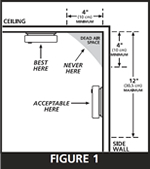 Selecting the proper location for your Smoke/CO Alarm, as described on Pages 8-11. To ensure aesthetic alignment of the alarm with the hallway, or wall, the �A� line on the mounting bracket must be parallel with the hallway when ceiling mounted, or horizontal when wall mounted. Install the alarm on the mounting bracket and rotate the alarm in the direction of the �ON� arrow on the cover until the alarm ratchets into place (this ratcheting function allows for aesthetic alignment). Note: The alarm will mount to the bracket in 4 positions (every 90 degrees). Two labels are included with your alarm. They have important information on what to do in case of an alarm. Add the phone number of your emergency service provider (for smoke or fire emergencies call '999' or for CO gas emergencies call 0800 111 999) in the space provided. Alternatively, for solid fuel emergencies call HETAS (0845 634 5626) or for oil based emergencies call Oftec (0845 658 5080). Place one label next to the alarm after it is mounted, and one label near a fresh air source such as a door or window. Pull the Battery Pull Tab (yellow tab protruding from unit) completely out of unit. This will automatically connect the battery. CAUTION: Due to the loudness (85 decibels) of the alarm, always stand an arms length away from the unit when testing. The test/reset button has four purposes. It tests the unit�s electronics, resets the CO alarm, activates the HUSH feature, and activates the Peak Level Memory Feature. After installation, TEST THE UNIT�S ELECTRONICS by pressing and releasing the test/reset button. A series of beeps will sound, followed by the message �Fire! Fire!� then another two series of beeps and the message �WARNING! CARBON MONOXIDE!� followed by 4 additional short beeps. Weekly testing is required! If at any time it does not perform as described, verify that the battery doesn�t need replacing. Clean dust and any other build-up off the unit. If it still doesn�t operate properly call the Consumer Hotline on 0800 917 0722. The HUSH� feature has the capability of temporarily desensitizing the smoke alarm circuit for approximately 10 minutes. This feature is to be used only when a known alarm condition, such as smoke from cooking, activates the alarm. You can put your Smoke/CO Alarm in HUSH� mode by pushing the test/reset button. If the smoke is not too dense, the alarm will silence immediately, the unit will verbally announce �HUSH MODE ACTIVATED�, and the green LED will flash every 2 seconds for approximately 10 minutes. This indicates that the smoke alarm is in a temporarily desensitized condition. Your Smoke/CO Alarm will automatically reset after approximately 10 minutes. When the unit returns to normal operation after being in HUSH� mode, it will verbally announce �HUSH MODE CANCELLED�, and sound the alarm if smoke is still present. The HUSH� feature can be used repeatedly until the air has been cleared of the condition causing the alarm. 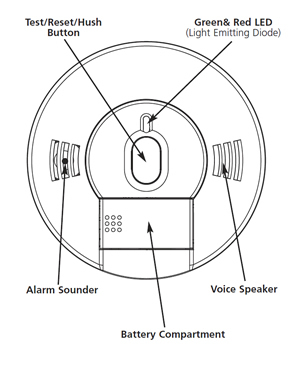 While the unit is in HUSH� mode, pushing the test/reset button on the alarm will also end the HUSH� period. NOTE: DENSE SMOKE WILL OVERRIDE THE HUSH� CONTROL FEATURE AND SOUND A CONTINUOUS ALARM. CAUTION: BEFORE USING THE ALARM HUSH� FEATURE, IDENTIFY THE SOURCE OF THE SMOKE AND BE CERTAIN A SAFE CONDITION EXISTS. If the Smoke/CO Alarm is sounding a CO alarm, pressing the test/reset button will initiate a test/reset. If the CO condition that caused the alert continues, the alarm will reactivate. The red LED will flash in conjunction with the alarm sounder. Therefore, the red LED will flash during a smoke alarm, a CO alarm, a low battery mode chirp and a unit error mode chirp. Standby Condition: The LED will flash every 30 seconds. Alarm Condition: The LED will flash every second signifying that the alarm sensed a smoke or CO hazard. HUSH MODE Condition: The LED will flash every 2 seconds while the alarm is in HUSH mode. Alarm Memory: The LED blinks once every 16 seconds to indicate a hazardous condition was previously detected. To make your smoke/CO alarm tamper resistant, two tamper resist features have been provided. The first is used to discourage removal of the alarm while the second is for the battery. To activate the mounting bracket tamper resist feature break off the four posts in the square holes in the trim ring (see figure 5A). When the posts are broken off, the tamper resist tab on the base is allowed to engage the mounting bracket. Rotate the alarm onto the mounting bracket until you hear the tamper resist tab snap into place, locking the alarm on the mounting bracket. Using the tamper resist feature will help deter children and others from removing the alarm from bracket. NOTE: To remove the alarm when the tamper resist tab is engaged, press down on the tamper resist tab, and rotate the alarm off of the bracket (see figure 5B). This alarm also has a battery carrier tamper resist feature, which helps prevent the battery carrier from being opened. This feature is effective in preventing the removal of the battery from this device. To activate the battery carrier tamper resist feature, remove the unit from the trim and locate the small cut-out in the middle of the product label on the back of the unit. With a small screwdriver, or similar tool, slide the switch towards the top of the label. (see Figure 6) The tamper resist feature is now active and the battery carrier cannot be opened until the tamper resist feature is deactivated. NOTE: Before activating the battery carrier tamper resist feature, make sure a fresh battery is installed in the unit and that the battery carrier is properly closed. If the battery carrier tamper resist feature is activated while the battery carrier is open, the battery carrier will not close and the unit will be inoperable. 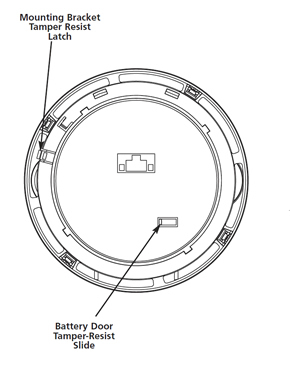 To deactivate the battery carrier tamper resist, in order to change the smoke alarm battery, remove the unit from the trim plate (see Smoke Alarm Tamper Resist Feature if activated), and locate the small cut-out in the middle of the product label. Using a screwdriver, or similar tool, slide the switch towards the bottom of the product label. The battery carrier can now be opened and the battery changed. Never restart the source of a CO problem until it has been fixed. NEVER IGNORE THE ALARM! This carbon monoxide alarm is designed to detect carbon monoxide gas from ANY source of combustion. It is NOT designed to detect any other gas. It can be possible to arrange for a CO inspection of your home or property, but some inspectors may charge for this service. Kidde will not pay for or reimburse the owner or user of this product for any repair or dispatch calls related to the alarm sounding so it is advisable to inquire about fees prior to having such a service performed. IF THE TAMPER RESIST FEATURE HAS BEEN ACTIVATED, REFER TO TAMPER RESIST FEATURE DESCRIPTION ON PAGE 17 FOR REMOVAL INSTRUCTIONS. Remove the alarm from the mounting bracket by rotating the alarm in the direction of the �OFF� arrow on the cover. If any form of battery failure is detected the red LED light will flash and the unit will �chirp� one time, followed by the warning message �LOW BATTERY�. This cycle will occur once every minute for the first hour. After the first hour, the red LED light will continue flashing accompanied by the chirp only sound every 60 seconds. The voice message �LOW BATTERY� will sound once every fifteen minutes during the chirp only cycle, and will continue for at least seven days. If the red LED light flashes along with a chirp every 30 seconds, and is not followed by the voice message �LOW BATTERY� as described above, your unit has malfunctioned. Call our toll free Consumer Hotline at 0800 917 0722 for instructions on how to return the unit. CAUTION: YOUR SMOKE/CO ALARM IS SEALED AND THE COVER IS NOT REMOVABLE! Note: If battery carrier tamper resist feature has been activated it will need to be deactivated in order to change the battery. Refer to section 3 �Battery Carrier Tamper Resist Feature� for instructions. To replace or install the battery press on the battery carrier and then release to allow the carrier to pop open. The battery can then be pulled out of the carrier. When installing a new battery into the carrier, make sure the battery terminals are exposed and that the polarity matches the markings printed on the battery carrier. Completely press the battery carrier down into the alarm and release, the battery carrier will lock into the closed position. A missing or improperly installed battery will prevent the battery carrier from closing and result in improper alarm operation. This smoke alarm uses a 9V battery. A fresh battery should last for one year under normal operating conditions. WARNING! Use only the batteries specified. Use of different batteries may have a detrimental effect on the Smoke/CO alarm. A good way to remember is to do this when you put your clocks back one hour in the Autumn. Ten years after initial power-up, this unit will �chirp� twice every 30 seconds to indicate that it is time to replace the alarm. A label has been provided on the side of the alarm that has �Replace by� printed on it. Write the replace by date on the label. The date written on the label should be ten (10) years after the alarm was initially powered. This alarm does have end of life Hush� which allows you to silence the trouble chirp for two days giving you extra time to replace the unit at a more convenient time. To activate, press the test/reset button. While in the End of Life Hush� mode, will still detect CO and Smoke. This feature can only be used for 30 days from the time the unit first indicates end of life. At the end of the 30 day period the alarm cannot be hushed and must be replaced immediately. Verify unit alarm, lights and battery operation by pushing the test/reset button once a week. Clean your alarm monthly using compressed air or a vacuum cleaner hose and vacuuming or blowing air through the openings around the perimeter of the alarm. If cleaning does not restore your alarm to normal operation the alarm should be replaced. REINSTALL IMMEDIATELY AFTER CLEANING AND THEN TEST USING THE TEST/RESET BUTTON! IF TAMPER RESIST FEATURE HAS BEEN ACTIVATED, REFER TO TAMPER RESIST FEATURE DESCRIPTION ON PAGE 14 FOR REMOVAL INSTRUCTIONS. Never use detergent or other solvents to clean the unit. Avoid spraying air freshener, hair spray, or other aerosols near the Smoke/CO Alarm. Storing the unit in a plastic bag during any of the above projects will protect the sensors from damage. Do not place near a nappy bin. WARNING! Reinstall the Smoke/CO Alarm as soon as possible to assure continuous protection. When household cleaning supplies or similar contaminates are used, the area must be well ventilated. The following substances can affect the CO sensor and may cause false readings and damage to the sensor: Methane, propane, iso-butane, iso-propanol, ethyl acetate, hydrogen sulfide, sulfide dioxides, alcohol based products, paints, thinner, solvents, adhesives, hair spray, after shave, perfume, and some cleaning agents. Carbon Monoxide (CO) is a colourless, odourless, and tasteless poison gas that can be fatal when inhaled. CO inhibits the blood�s capacity to carry oxygen. CO can be produced when burning any fossil fuel: gasoline, propane, natural gas, oil and wood. It can be produced by any fuel-burning appliance that is malfunctioning, improperly installed, or not ventilated correctly. Possible sources include furnaces, gas ranges/stoves, gas clothes dryers, water heaters, portable fuel burning space heaters, fireplaces, wood-burning stoves and certain swimming pool heaters. Blocked chimneys or flues, back drafting and changes in air pressure, corroded or disconnected vent pipes, can also cause CO. Vehicles and other combustion engines running in an attached garage and using a charcoal/gas grill or barbecue in an enclosed area are all possible sources of CO. Do not BBQ in enclosed spaces. Excessive spillage or reverse venting of fuel-burning appliances caused by outdoor ambient conditions such as: Wind direction and/or velocity, including high gusts of wind, heavy air in the vent pipes (cold/humid air with extended periods between cycles), negative pressure differential resulting from the use of exhaust fans, simultaneous operation of several fuel-burning appliances competing for limited internal air, vent pipe connections vibrating loose from clothes dryers, furnaces, or water heaters, obstructions in, or unconventional, vent pipe designs which can amplify the above situations, extended operation of unvented fuel-burning devices (range, oven, fireplace, etc. ), temperature inversions which can trap exhaust gasses near the ground, car idling in an open or closed attached garage, or near a home. Every year have the heating system, vents, chimney and flue inspected and cleaned by a qualified technician. Always install appliances according to manufacturer�s instructions and adhere to local building regulations. Most appliances should be installed by professionals and inspected after installation. Regularly examine vents and chimneys for improper connections, visible rust, or stains, and check for cracks in furnace heat exchangers. If at any time you discover any faults, contact a qualified technician. Verify the color of flame on pilot lights and burners is blue. A yellow or orange flame is a sign that the fuel is not burning completely. Teach all household members what the alarm sounds like and how to respond. Initial carbon monoxide poisoning symptoms are similar to the flu with no fever and can include dizziness, severe headaches, nausea, vomiting and disorientation. Everyone is susceptible but experts agree that unborn babies, pregnant women, senior citizens and people with heart or respiratory problems are especially vulnerable. If symptoms of carbon monoxide poisoning are experienced seek medical attention immediately. CO poisoning can be determined by a carboxyhemoglobin test. The above levels of exposure relate to healthy adults. Levels differ for those at high risk. Exposure to high levels of carbon monoxide can be fatal or cause permanent damage and disabilities. Many cases of reported carbon monoxide poisoning indicate that while victims are aware they are not well, they become so disoriented they are unable to save themselves by either exiting the building, or calling for assistance. Also, young children and household pets may be the first effected. Familiarisation with the effects of each level is important. Prepare and practice a home escape plan twice a year, including drills at night. Know two ways out of every room (door & window) and identify a meeting place outside the home where everyone will gather once they have exited the residence. When two people have reached the meeting place, one should leave to call 999 while the second person stays to account for additional family members. Establish a rule that once you�re out, you never re-enter under any circumstance! Never smoke in bed, or leave cooking food unattended. Teach children never to play with matches or lighters! Train everyone in the home to recognize the alarm pattern, voice message warning and to leave the home using their escape plan when it�s heard. Know how to do �Stop, Drop and Roll� if clothes catch on fire, and how to crawl low under smoke. Install and maintain fire extinguishers on every level of the home and in the kitchen, basement and garage. Know how to use a fire extinguisher prior to an emergency. Second level and higher occupied rooms with windows should have an escape ladder. Current studies have shown smoke alarms may not awaken all sleeping individuals, and that it is the responsibility of individuals in the household that are capable of assisting others to provide assistance to those who may not be awakened by the alarm sound, or to those who may be incapable of safely evacuating the area unassisted. Kidde warrants that the enclosed alarm (but not the battery) will be free from defects in material and workmanship or design under normal use and service for a period of ten years from the date of purchase. The obligation of Kidde under this warranty is limited to repairing or replacing the alarm or any part which we find to be defective in material, workmanship or design, free of charge, upon sending the alarm with proof of date of purchase, postage and return to Customer Service Department, Kidde Safety Europe Ltd, Mathisen Way, Colnbrook, Berkshire, SL3 0HB. This warranty shall not apply to the alarm if it has been damaged, modified, abused or altered after the date of purchase or if it fails to operate due to improper maintenance or inadequate DC power. Any implied warranties arising out of this sale, including but not limited to the implied warranties of description, merchantability and fitness for a particular purpose, are limited in duration to the above warranty period. In no event shall the Manufacturer be liable for loss of use of this product or for any indirect, special, incidental or consequential damages, or costs, or expenses incurred by the or any other user of this product, whether due to a breach of contract, negligence, strict liability in tort or otherwise. The Manufacturer shall have no liability for any personal injury, property damage or any special, incidental, contingent or consequential damage of any kind resulting from gas leakage, fire or explosion. Also, Kidde makes no warranty, express or implied, written or oral, including that of merchantability or fitness for any particular purpose, with respect to the battery. The above warranty may not be altered except in writing signed by both parties hereto. Your Kidde Combination Smoke & CO Alarm is not a substitute for property, fire, disability, life or other insurance of any kind. Appropriate insurance coverage is your responsibility. Consult your insurance agent. Removal of the front cover will void the warranty. This alarm is not intended to alert hearing impaired individuals. During the specified warranty period Kidde will repair or replace, at its discretion any defective Kidde Combination Smoke & CO Alarms that are returned in a postage paid package to the following address: Customer Service Department,Kidde Safety Europe Ltd, Mathisen Way, Colnbrook, Berkshire, SL3 0HB, UK. Please include your name, address and phone number along with a brief description of what is wrong with the unit. For further assistance please call our toll free Consumer Hotline at 0800 917 0722. Damage from neglect, abuse or failure to adhere to any of the enclosed instructions will result in termination of the warranty, and the unit will not be replaced or repaired. This manual and the products described herein are copyrighted, with all rights reserved. Under these copyright laws, no part of this manual may be copied for use without the written consent of Kidde. If you require further information please contact out Consumer Hotline at 0800 917 0722 or write us at: Customer Service Department, Kidde Safety Europe Ltd, Mathisen Way, Colnbrook, Berkshire, SL3 0HB.